Hope everyone had a great Independence Day! GPS came in handy more than once! Here's your first declaimer of the day: we don't drive much. Maybe 4-5 times a year? In fact, I'm basically impressed by anything that moves faster than a crosstown bus. When I approached the good people at General Motors about a car review, I might have written something like, "I'll take anything with four tires, an engine and a steering wheel," because I know this much: those parts are necessary to making a car go. What they delivered to my door was a 2013 Buick Verano, and let me tell you, it got my attention (Quick sidebar: When did cars stop using keys? The whole push-a-button-and-your-car-starts thing is beyond cool). Billed as a "compact luxury sedan," the Verano is a mix of sass and efficiency. Clean lines and leather interior make it a hot little number, and as we quickly discovered, GPS and a video screen for parallel parking help you not get lost or wreck the car. Two big pluses! Now, with two small children and two adults, I will say there wasn't a ton of extra room once the car seats were in, but it doesn't take a brain surgeon to come to this conclusion. That being said, the trunk is quite large. Sufficed to say, we don't travel lightly, and that's a fact we, of course, blame on the children. Between a large suitcase, pack-n-play, and numerous bags in all different shapes and sizes, we managed to pack the trunk with room to spare. I think this is a great car for zipping around town with the fam. Cross country road trip? Probably not the best idea with two little munchkins in the back seat, but then, that's probably not a great idea in a motor home, either. We loved the fact that the Verano has awesome pick up and gas mileage (we were gone a week, drove every day and only spent $70 on gas). 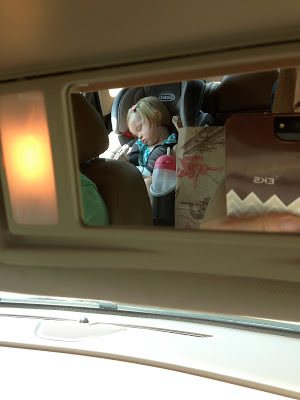 Additionally, I loved the tinted windows... they helped keep the car on the cool side, and outsiders from seeing a toddler having a temper tantrum. 3 gals looking sporty next to their "compact luxury sedan"
True story: Husband was on a business trip last week, and he actually called me from the road to tell me how much he missed driving around in the Verano (no offense to his other ride, of course). 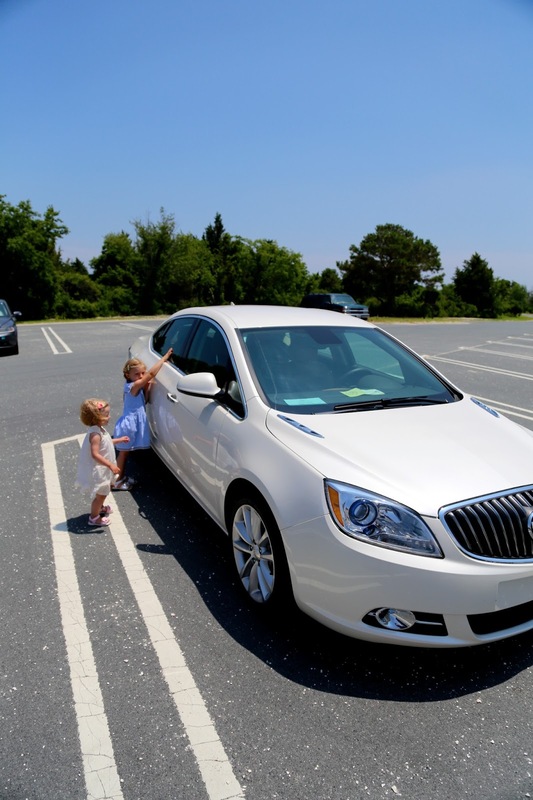 You can read all about the specifics of the 2013 Buick Verano on their website, but take it from me, a newfound slightly knowledgable car person... comfort, style and efficiency can go hand in hand behind the wheel. Disclaimer: GM provided us with a week-long Buick Verano car rental for the purposes of this review. All opinions expressed herein are my own.